What is a good deal in today’s market? While we continue to see opportunities at “distressed” pricing, what exactly does that mean? Real estate doctrine concludes market value is a function of willing seller – willing buyer. In the current market dynamic the willing buyer has been replaced with the “opportunity buyer” (a.k.a. vulture) and while willing sellers exist, the current market is providing a multitude of financially insolvent people or projects that require disposal on someone else’s terms (not willing). The downward pressure on pricing, forced by the financial woes of some, is affecting the value for all. Therefore, can the deals being done in today’s dollars be considered distressed, or rather, should we consider them an indication of market adjustment and appropriately refer to them as today’s value? The reality is that distressed assets make up a small portion of the total inventory and there are many more factors in determining market value. Just as sales of foreclosed homes are putting downward pressure on median home price thus effecting residential land values, increases in commercial sector vacancy and sublease availability are driving down rents and negatively effecting asset values. Couple that with the underwriting criteria and return expectations of today’s buyer and it becomes a game of “how low can we go”. 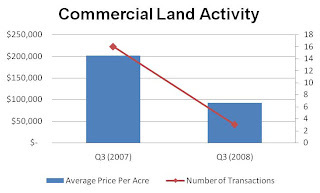 For example, a quick review of Q3 2007 commercial land activity shows 16 transactions totaling 403 acres at an average of $201, 609 per acre. Compare that to closings in Q3 2008 (Xanax please) adding up to a paltry 3 for a measly 13 acres at a dismal $92,291. Since no one is willing to stake their reputation on whether we’ve actually hit the bottom of the current market decline, when is the right time to buy? The reality is that the bottom is not realized until we’ve passed it and are headed back up. For this reason, purchases should not be timed on corresponding to a perceived bottom but rather a fair and objective evaluation of the opportunity in current terms and expectations. The current market conditions have led to an explosion of private equity opportunity funds creating intense competition. This leads us back to the situation of willing buyer and not so willing seller. Most of the perceived deals currently in the market involve a lender. Therein lies the problem, between loan officers transitioning to asset managers and the fear of a surprise knock on the door by the FDIC, the industry is in flux (understatement). Further complicated by the federal bail out discussions, banks can’t decide what to discount, how much to discount and when to get it off the books. This uncertainty is leading to a new trend in lender-involved opportunities through loan acquisition. The assumption is that lenders would rather unload the nonperforming loan (at a steep discount) rather than go through the foreclosure process. Once the note is secured, the investor (new lender) then obtains the property through foreclosure while removing any secondary debt and equity on the part of the owner. As it relates to declining land values, this process helps adjacent properties by not actually proving a comparable sale. Where does this leave us with respect to quantifying market adjustments and current land values? It is nearly impossible to quantify the actual market adjustment in terms of percentage decline per industry sector, however, I offer the following observations: Based on transaction volume, buyers appear optimistic with residential land adjustments while commercial land transactions have slowed considerably as vacancies continue to rise; The rural communities are taking a beating with affordable options returning to the metro area; Land values have become very specific to submarket offerings and activities. Some would relate the recent land value roller coaster to the stock market (ironic that both are causing such despair); however, I would submit that having a tangible asset in today’s market provides a certain sense of security. This article was printed in the December 17, 2008 issue of the Nevada Red Report and can be found online at www.theredreport.com. As a member of the Industrial Properties Group, Dan has participated in the sales and leasing of a wide variety of Industrial properties from 1,000 to 700,000 sqft in Northern Nevada. Dan's primary goal is to provide unsurpassed customer service to the clients he represents..
We are in undeniably difficult economic times. It’s affecting everyone from tenants, to owners, to contractors, to brokers. But recently I had an experience which may shed some light on how we can all pull through this together. Allow me to set the stage. A tenant came forward professing a need to expand their lease space. Certainly the owner was pleased to hear this and negotiations began. In the process of outlining the deal, it became clear that the tenant could only go so high on rent and the owner could only go so low. Because the contemplated space was in shell condition, the tenant improvement allowance, the design of the space and ultimately the contractor’s price for those improvements would make or break the deal. The bid for the improvements went out to a number of contractors. When the numbers came back, even the low bidder’s price was substantially higher than the Tenant Improvement allowance. The owner upped the allowance as high as they could possibly go, but they couldn’t cover the entire difference. The option to amortize the overage into the lease was presented to the Tenant, but they simply could not pay anymore than they had previously negotiated. It appeared the deal was dead. Often, this would be the end of the story. The contractors were notified the deal wasn’t going to happen. The low bidder took the time to ask a simple question, “What would it take to get the deal to happen?” When I told him the Tenant Improvement allowance that was offered (it was 12.5% below the low bid he’d given), he laughed. He certainly needed the work, but he wasn’t going to pay us to build the space! To his credit, he did make a suggestion. The Tenant agreed to sit down, listened with an open mind, took the Contractor’s suggestions to heart and had enough flexibility to give the contractor “some room to work with”. A few days later the contractor came back with a new bid…to everyone’s amazement he’d hit the number! In the end, the owner had given a little more in T.I. dollars than they’d budgeted, the tenant settled for perhaps 80% of the build-out they wanted and the contractor (and likely his subs) took a lower return than usual. If in tough times we all pull together, maybe we don’t get everything we want. But, we can all get what we need. Where do your tenants come from in a recession and where are they going ? Apartment managers are reporting a curious phenomenon in the rental market—the borrowers in foreclosed property are not showing up to lease an apartment. One conjecture is that such tenants would prefer a single-family residence and they can still find housing in the rental shadow market. Others are leaving the area entirely to house with family members, especially if job loss led to the foreclosure. An apartment owner might not want to target a marketing effort to capture this business, but in a recession the tenant who can pay and has solid employment could be a good bet if the price is right. Data for defaulting borrowers by residential address is widely available and can be sorted for neighborhoods near the apartment complex. Defaulting homeowners could show up later in the cycle when the shadow market for single family dwellings is nearly absorbed, but that’s months off. Astute managers are being very pro-active with tenants who deliver notices to vacate. First, they qualify the tenant with questions to identify whether the motivation is financial and the cause of the problem. Then they engage the tenant in negotiation. Can the tenant trade down within the complex to a smaller unit ? Can the tenant move in with a friend in the complex ? Can the rent be adjusted to keep the tenant through the winter season ? Owners really appreciate this skill because it maintains occupancy with tenants who have a track record of payment and performance. Transfers within the complex conserve occupancy and build incredible goodwill among tenants. Owners can do several things to keep pulse on the turnover in their buildings. Managers could be instructed to categorically track where tenants reside as applicants and to ask their motivation for the move. Tenants on notice can be asked to complete a simple questionnaire to track why the tenant is vacating, pertinent attitudes toward management and facilities and what kind of housing the tenant is relocating into. A polite expression of concern for vacating tenant can lead to a discussion about staying in the building if that can be done. Why not make this part of the traffic and showings report ? Unfortunately, skip-outs are way up and that leaves ownership in the lurch if they compromised receipt of a full security deposit as a move-in special. Frequently, the manager has lost valuable time in recovering possession and lease-up when the unit is abandoned without notice. This may be a time to qualify tenants even more carefully, not relax standards across the board. No tenant is always preferable to the bad tenant, but vacancy management is the watchword this winter. What are you seeing at the street level now ? What have you done to slow down the vacancy ? We look forward to your comments and impressions. Managers in every rental submarket are reporting a steady rise in notices to vacate from Hispanic families returning to Mexico. The Holidays have always been a time to return to family, with presents and some cash, especially for young men who had not established a household in America. Now, though, job loss has meant that young families are returning too, and they may not be back in February. After all, jobs brought them to the region and jobs alone will bring them back again. In past recessions, there were always particular regions said to be hiring and willing workers traveled to take new work. Now the perception is widespread that opportunities are few and unlikely to last. And the families are leaving. For the apartment market as a whole, February and March will be a bellwether of overall vacancy throughout 2009. That will coincide with another wave of demand from tenants in single-family and condo rentals who lose possession in a foreclosure and show up at the rental office with a job, good credit and an eviction on their records. Will they be disqualified ? For the apartment complex whose tenant profile is Hispanic families, this may fill the gap. But a tenant who has been through an eviction is three times more likely to default than one who has not, simply because they have traded the temporary free rent of default before dispossession against the black mark that's already on their record. Often, they have left the house or condo in deplorable condition but the rental manager cannot confirm with a prior landlord who lost the property to the bank. For owners, now is the time to reassess the rentability of your units and ask exactly who you want to attract as a tenant and how to reach them. Owners who wait and suffer double-digit vacancy risk de-stabilizing their asset, demoralizing the manager and jeopardize the tenant quality profile. Do you own or manage units where this trend is a factor ? We welcome your thoughts, comments and predictions. The Reno retail market continues to see new retailers moving to the area. Recent openings include Cabela’s, Scheel’s, Target, and Whole Foods. Others anchor tenants such as Wal-Mart, Lowe’s, JC Penney, Staples, CVS and Walgreen’s are finalizing new sites as well. Development has been focused in the growing areas such as Spanish Springs, the Marina in east Sparks, west Reno and South Reno. Even with a slowdown in the pace of residential housing developments, retail projects that are under development are continuing to march forward to completion. Downtown Reno continues to see residential condo projects such as Palladio’s and the Montage finishing their build-out. Ruth Chris’ Steak House will be joining the mix of restaurant choices downtown with their new site in the Montage. A significant change to downtown is the recently approved new minor league baseball stadium to be located on the eastern edge of downtown. All of this new activity is expected to lead to a significant addition of new restaurants and retail shops. As a result of mergers, national tenant bankruptcies and anchor store cut backs, Reno is seeing an up-tick in the vacancy rates. There have been a several announced closures of big box tenants including Wild Oats, Comp USA, Super Kmart, Mervyn’s, Linen’s and Things and Shoe Pavilion. It is a great time to be looking for good deals within the second generation space category. A podcast where we talk about commercial real estate, development and things going on in our market place here in Northern Nevada. Accentuate the Positive | How does Northern Nevada compare ? We’ve all heard, “If it didn’t always rain in Seattle everyone would live there.” or “San Diego is the most livable city.” When a company analyzes where to locate a distribution or manufacturing facility there are many more factors to consider other than the usual rents, taxes, utilities and labor. Companies are looking more in depth at what a region has to offer. Other factors now being considered include benefits, transportation, housing, health care, personal & income taxes, climate, crime, recreation, arts and entertainment, cost of living and education. When facility costs are considered, Reno ranks right at the top with an average asking rate of $0.33/sf NNN. Only Fresno has an average lower rate ($0.29/sf NNN) and as far as the quantity of offerings, Reno ranks fourth behind the much larger markets of Phoenix, San Diego and Ontario. This bodes well for prospects looking for a competitive rate. Reno ranks first with respect to state taxes, tied with Las Vegas. Employment taxes are in the middle of the pack with Phoenix, Portland, Boise and Seattle all slightly lower yet our rates are nearly 45% lower than California. We don’t fare as well with property tax rates, ours are some of the highest with only Boise and Phoenix being higher. Only Idaho, Utah and Arizona join Nevada as right to work states. Utility costs pose a sore spot for our region with electricity (8th) and natural gas (last) in the rankings. Only Southern California had higher electricity rates and when water and sewer are included, Reno has the highest overall costs with Fresno a distant second. Often we cite the other lower operating costs offset this disadvantage. A positive factor in the comparison is labor. We rank favorably in wage rates behind only Boise, Fresno, and Phoenix. When factoring in fringe benefit costs, we rise to the top 3 passing Fresno. Our unemployment rate hovers near 4.2% and all of the cities were similar except Fresno 8.2% and Boise 1.7%. Jason Quintel of Panattoni Development in Phoenix cited a large labor pool, low wages and a secondary education feeder system as Phoenix’s strengths when costs are compared. Combined with a strategic location to California, Phoenix is a formidable competitor. Transportation is becoming an increasingly important factor. Reno has the lowest number of trucking carriers (79) but is fortunate to have as good or better rail service than the competition. Boise and Las Vegas have the weakest rail service (1 provider) and Portland and Seattle each have three rail providers. Reno’s proximity to seaports is the closest of any inland city except Ontario. Increasing fuel costs are becoming more important when considering proximity to Long Beach/Los Angeles seaports, combined the nation’s largest. Air cargo ranking is significant when correlated to our city’s size and could become an untapped market for us to pursue. While Reno clearly has the lowest housing rental rates in the study, we also have some of the most expensive home prices with only San Diego, Seattle, Ontario and Sacramento being higher. We rank #2 in per capita income (Seattle #1) Our sales tax rates are amongst the lowest (#4 with Portland, Boise and Salt Lake lower) and we rank best along with Las Vegas for (lack of) personal and income taxes. Overall cost of living ranking is in the upper middle ranks with Boise, Phoenix, Salt Lake City and Las Vegas being lower. Crime rate statistics are relatively low with only Salt Lake, Boise, San Diego and Portland beating Reno. Our commute time is the shortest of all of the cities. Health care costs for individuals is in the lowest three (behind San Diego and Boise), we have the highest hospital bed count per capita and rank #2 in doctors per capita. Recreational rankings are more of a personal taste but when considering golf, lakes and dining, Reno would tie for fourth along with Portland and San Diego and being topped by only the much larger cities of Phoenix, Las Vegas and Seattle. In arts and culture we rank in the lower percentile, but ahead of similarly sized Boise, Ontario, Fresno and Sacramento. When all of the above quality of life factors are considered we rate consistently high. Excepting Las Vegas and Central California, Reno has the lowest percentage of high school and college graduates. When comparing elementary and secondary education levels, we rank second lowest in expenditure per pupil (Boise lowest) and have the second lowest graduation rate ahead of only Phoenix. These factors could cause concern for prospective companies. There you have it. With several new large facilities available, northern Nevada is poised to compete with the best of the west’s cities. If you were able to select where to locate a facility (and possibly your family), northern Nevada ranks quite high and confirms what all of us Northern Nevadans have known for some time. When stacked up against the competition, not only are we strategically located to serve the eleven western states, but we offer a lower cost of living, low occupancy costs, great tax incentives, abundant recreation and an affordable labor force. We need to ensure we summarize and accentuate the positives that make northern Nevada special. During his career, Scott has worked with clients such as: Barnes & Noble, GM, Merck Pharmaceutical, Henry Schien, Home Depot and Ahold to facilitate their real estate needs. ~Mark TwainIt seems you can’t read a story in the mainstream national press that doesn’t include a dire forecast about the state of the US economy. Many local reports follow that same line of thinking. I am not here to refute the facts of the current difficulties that the Northern Nevada economy is facing; however, I do take issue when the current difficulties are extrapolated to long-term forecasts. Such prognostications are particularly short-sighted when applied to commercial real estate and more particularly the local office market. Too often in my career I have heard people mistake a short-term market correction for a long-term trend. In few other industries is this more problematic than the office sector of commercial real estate. The NAI Alliance office team, Scott Shanks, Dominic Brunetti and Matt Grimes, are reporting a current office market vacancy rate of 16.05%. When unoccupied sub-lease space is included in the calculation, the availability rate is 17.57%. While these statistics are very real and problematic, the Office Team will tell you that they do not reflect the whole picture. Looking at current occupancy statistics can be like viewing two minutes of a three hour movie; it doesn’t show you the whole picture. Some may point to occupancy statistics as an indicator of ill-health in the local office market. In my mind this situation is nothing more than a short-term disruption in the supply and demand for office space – not necessarily an indicator of long-term problems. The demand for office space during 2006 and 2007 was artificially inflated by the “irrational exuberance” surrounding the residential housing boom. National and regional home builders entered the market and rapidly expanded their operations. Mortgage companies, engineering firms, contractors and sub-contractors, fueled by the perception that the housing expansion would continue, increased their office needs. Developers brought new projects on line to meet this growing demand, but compared to past boom cycles, developers remained somewhat restrained, partly due to the fact that the housing boom was severely impacting their cost of construction thus making some projects too uncertain. The result was that demand outpaced supply and prices (rents) increased dramatically. Now that artificial demand created by the housing bubble has vanished, we are left with a complete reversal in the supply/demand equation and we are experiencing downward pressure on rents. But does this mean that the demand for office space has completely gone away? Absolutely not! New lease transactions and expansion continue. The NAI Alliance Office Team is currently assisting a number of new and existing clients to address their growing need for new office space. The same fundamentals that drove the economy of Northern Nevada prior to the housing bubble will continue to propel this market in the future. Population based office demand will continue to grow as banks, insurance companies and other financial service companies will expand to meet the demands created by a growing population base. Efforts to attract new businesses like Microsoft Licensing, Charles River Laboratories, and Intuit will be met with success. Most importantly, small companies will continue to grow and flourish here due to the entrepreneurial spirit and quality of life this area possesses. This may all sound a bit overly optimistic given the current state of the economy, but that is exactly the point. When looking at an asset class like real estate, it is important to have a long term view of the economic fundamentals. While the long term supply of well located office space is not fixed; it is constrained. And while short-term demand for office space is cyclical; long-term, demand for such space should (at a minimum) grow at a pace equal to the population. Demand can potentially grow even faster if new business is attracted to the area. While I accept the statement that the market for office space in Northern Nevada is facing a disruption in the relationship between the demand and supply for such space, I do not accept that this disruption is due to a fundamental problem in the market. Rather, it is a short term correction creating opportunities for smart investors and space users. Rumors of the demise of the office market in Northern Nevada are greatly exaggerated. Reno Apartment Investment Returns | Where do they come from ? Apartment buyers today will tell you they expect returns to come from current cash flow and appreciation in the range of 8 to 11% per annum. But do the assets really deliver that in a normal market? 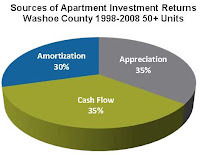 Owners of apartments in Washoe County built before 1985 have held their asset on average more than 8 years. Almost half the owners have held more than 10 years. The median holding period for product built after 1984 is now 5 years. Nearly 25% who own the newer product have owned fewer than 3 years. The result is that 80% of the assets currently held did not change hands when owners might have exploited the benefits of extraordinary appreciation during the recent period of historic low cap rates. The remaining 20% of assets were acquired at a cap rate owners may not see again for years. Historically, apartment appreciation tracks rent growth. From May, 1998 through May, 2008 median monthly rent in Washoe County rose from $696 to $910, a nominal compounded annual rate of 3.5%. But adjusting for inflation using the Western regional index of CPI (All Items/ Urban Wage Earners) rents actually declined slightly in real dollars. (Figure 1) To have kept pace with inflation, median monthly rent should have reached $925 in 2008. The cap rate compression during the recent boom was driven by rates, not rents. Nearly everyone in the industry expects cap rates to be higher within the investment horizon of most owners, because the cost of financing is expected to rise at a compound rate significantly higher than nominal rents. Clearly the winners who disposed of assets during the boom reaped comparatively high rates of appreciation, and for them compounded assets returns were in some cases above 10%. In the past 18 months, 14 sales of properties above 50 units in Washoe County showed a median annual adjusted appreciation of 6% for units with a median age of 31 years, held for 7 years and bringing a price of $112 per square foot. One property was sold at a loss. Buyers say they purchase apartment buildings to obtain cash flow but the skill set required to maximize cash flow prudently over time is very rare. Buying right in a buyer’s market gives an immediate yield advantage. But the problem buyers find immediately in trying to buy right is the sheer volume of capital chasing deals and the skepticism of sellers trained to expect yesterday’s low cap rate. For product under third-party management, the working assumptions commonly found are that rents will rise 3% per year against expenses rising at 2%, with cash on cash return expanding at just over 1% per year with normal leverage. Achieving an average monthly gross rent of $925 per unit represents a 6% cash on cash return with normal leverage at current rates, without regard to a capital improvement program put in place to preserve rentability. Owners may try to force gains by cost effective renovations in popular submarkets. Others reduce expenses, often jeopardizing the units’ future rentability for current income. Ultimately, the most influential factors driving revenue and expenses may be beyond an owner’s control—net regional immigration by retirees and other tax refugees, inflation, ad valorem tax advantages and regulations that inhibit new home ownership for some and subsidize it for others. Of all the sources of yield to an apartment owner, cash flow is the most difficult to forecast with confidence, especially as operating expenses begin to widely reflect the fuel cost wild card. Frequently overlooked is the most effective and predictable source of investment return for apartment owners—the forced savings of principal reduction through amortization. Over a typical holding period, the median equity build-up is 5% per year in real dollars. Ironically, the decision to achieve this yield is in the hands of the lender. Where, then, do apartment returns really come from? (Figure 2) Except in extraordinary markets, returns come fairly equally from cash flow, appreciation and amortization. One of the first questions a real estate broker asks any prospective tenant is, “How many square feet are you looking for?” Some folks have a definitive answer, but oftentimes this simple question can elicit a vague response. This uncertainty is understandable. The consequences of committing to a lease in a space that doesn’t fit a company’s needs is far more painful than an ill-fitting pair of shoes and can even threaten the very life of your firm. So, how do you decide how much space is appropriate for your needs? There are many different ways to approach this problem. While no one way is always correct, the following methods (or a combination of methods) can provide some insight into this dilemma. Competitive analysis, or how green is my neighbor’s grass? Few businesses have a truly unique and revolutionary business model. Start by visiting your competition or companies engaged in a similar business. Estimate the space they occupy (measure the outside walls or count ceiling tiles — most are 4 feet by 2 feet) and look for signs of under- or over-utilization, such as excess product moved outside. This is a sure sign they are busting at the seams because no one wants to pay employees to move product in and out of the building each day. On the other end of the spectrum, dark offices, wide open spaces, or signage advertising space for sublease indicates less space is needed for this type of business. Finally, ask yourself if you can operate your business over the next three to five years in this size space. Budgetary analysis or how much can we afford? Rather than simply pick a budget number out of the air that feels good, consider the following: you don’t want to pay more in expenses than your revenue can support. The ratio of lease expense to gross revenue is called a rental factor, and it differs by industry and by the size of the business. To determine the rental factor other companies of your size and in your industry are paying, try visiting the free website, bizstats.com. This site collects the information provided by publicly traded companies and allows you to enter your annual gross revenue, select your industry, and see the average expenses similar businesses are paying. For example, choose “Manufacturing – Printing & Related Activities” and enter $5 millioin for annual revenue. Hit submit. A table will return showing the average profitability and expenses paid by similar companies. The “Rent – Office and Business Property” line reveals 3.2 percent is the average rental factor for this size and industry. Armed with this information when looking at spaces in the market, perform a simple calculation: Lease Payment divided by Rental Factor equals Required Revenue. So, if you are looking at a space that costs $10,000 per month, then $10,000 divided by 3.2 percent equals $312,500 per month in revenue required to support that space. Ask yourself if your gross revenue is more or less than $3.75 million annually. If not, you may want to pass on that space. You can also take your gross revenue for the past year, divide by 12, and divide the answer by your rental factor. This provides a monthly budgetary number to use when determining your target space. Demand analysis, or where am I going to put all this? Call it what you will — “production area”, “company roster”, or “inventory” — identify the factor driving your requirement for physical space. Use one or more of the following heuristics to arrive at an estimate of the size space you need. • Workroom – if you manufacture, assemble, or otherwise produce a product, it makes sense to identify how much room your production process requires to operate at optimal efficiency and acquire only the space required to do so. • Office space per employee – 250 square feet per employee or 1::250 is a good rule of thumb for general office space. If you have folks in cubes or in a call center the ratio is closer to 1::100. If you have a law firm, financial services company, or medical use, the ratio is closer to 1::400. Space planners or office furniture companies can give you a more specific idea of how much space you’ll need for your employees based on the type of workspace they utilize. • In a warehouse, the space your average amount of inventory occupies is a good starting point. Keep in mind, however, that your annual peak inventory must be accommodated somehow. If you have a great deal of variance in inventory throughout the year, consider finding an outsourcing partner who can take your overflow in peak periods, allowing you to pay for only the amount of space you most often use. Otherwise, you’ll have to lease more space, pack your product in tighter or higher at peak periods, and/or manage your supply chain more efficiently. Sophisticated warehousing and distribution companies use a number of metrics to monitor the number of inventory turns, warehouse efficiency, and space utilization they achieve. Based on the changes in these metrics over time, they are able to forecast the amount of space they will likely require into the future. Strategic analysis, or what am I going to be when I grow up? One of the most significant challenges of picking a new space to lease is that most commercial leases require a three- to five-year commitment. Inevitably, business owners must ask themselves if the space that fits their need today will still work three to five years from now. An interesting paradox presents itself in this discussion. On one hand, nimble companies who are most able to adapt to changing business environments often achieve the greatest rewards; however, operating efficiency, which includes limiting expenses like lease payments, also contributes to profitability. Ultimately, the lease decision is one more example of an important factor dependent on the strategic direction of the firm. Suffice it to say, that the space you commit to in a lease will either limit or enhance your achievement of your strategic goals. In conclusion, “How much space are you looking for?” is not as simple a question as it may seem. The answer depends on more factors than one might expect. However, with the consequences of a bad decision as dire as they are, careful consideration is warranted. Competitive analysis, budgetary analysis, demand analysis, and strategic analysis will provide insight into finding the answer to this question, resulting in a lease which is appropriate to the amount of space your company needs. A discussion of the current residential market and it’s effect on land values. Everyone in the industry knew the market was going to adjust at some point; the question was when and by how much. In a declining market it’s not applicable to point to last years numbers, or the year before that, as an indication of where we should be; unless you’re a masochist. One would hope we don’t have to go a whole year to realize that we missed the bottom, thus a month-to-month analysis is more applicable. With all the focus on the housing woes and increase in foreclosures has anyone noticed that residential home sales in the Truckee Meadows increased over the last three months and housing prices are on the rise? Don’t be confused by the national media, check the facts. Sales increased 3.3% nationally and 23% regionally and that’s just in the last month. While we can make the argument that housing prices have bottomed out, the demand is currently being met with standing inventory and plenty of finished lots ready for the next round of construction. Because the demand is still waning, the builder (wholesale purchaser of land) in this market have been non-existent, but wait. We can look to recent activity in Las Vegas as a barometer of things to come, several large tract purchases have recently closed and public builders are now in back in acquisition mode. For those land holders that can’t hang on the only apparent outlet is the private equity funds, a.k.a. vulture funds. In order to park this asset with a fund, who has very aggressive return requirements, the value must be so low that they will be insulated from any additional market adjustments. This typically means selling at 20%-30% of investment because an accurate value cannot be established. Here is the catch, the banks are the ultimate decision makers and have declined such aggressive cuts to date. Professionals in the market are looking for that first transaction that establishes the true market correction to land values. Some would point to Lennar’s transaction with Morgan Stanley but the reality is that this is an internal joint ventures for the purposes of getting the asset off the books and into a holding company. For those of us guiding our clients the safest approach is to back into a land value from a pro forma driven by house price, which is very sensitive to specific submarkets.